The technology related to Augmented Reality (AR) is still untapped in more than one way and still in its infant stage. It offers great scope to your brand to get greater ROI with your digital marketing endeavours. It is well-known that games like Pokémon Go that were AR based became a major hit among the people in mid-2016. A large segment of manufacturers and developers are working to create wearable gears based on AR technology to enhance the user experience and creating value for their brand. In the upcoming scenario, traditional advertisements will give way to AR-based 3D advertisements, allowing the users to stream 3D content directly to get an advanced experience. It enables the users to connect with your brand offering on a much deeper level emotionally. It also enables your marketers to augment your brand awareness, leading the customers to test your products well before they move towards placing the orders. The various mechanisms related to marketing are getting accelerated by data-driven technologies. Marketing automation enables marketers to establish better relationships with their customers by automating some of the repetitive tasks such as e-mail reminders, social media postings and leads generation. It is especially beneficial for the new market entrants and small companies that are competing with the top-notch companies by saving their effort and time. Customers are attracted to the brand in a better way when they receive e-mails that cater to their particular requirements. The process of marketing automation requires the use of software that is needed to be uploaded with the necessary data related to the user’s personalized data. It is a complex technology that can be better managed by partnering with a professional and experienced digital marketing company. AI has been continuously making dramatic shifts in the digital marketing world for the developments of any brand. It is running parallel to any other marketing tactics and promises to offer you better marketing opportunities in the future. It analyses the behaviour of your users by reading their search patterns on various social media platforms to enable the brands to understand the demands of their users better and offer them the services accordingly. AI can solve the problems much more effectively than any human mind, and provides you a defined output without any definite possibility of errors. Repetitive tasks can be better handled by AI bots that reduces the load of the employees, further enabling them to perform better. It allows your marketing team to develop a highly curated content that will be highly significant for the recipients. Social media platforms are ever-evolving and presenting the brands with unlimited opportunities to grow their business with digital marketing efforts. It enhances customer engagement in a big way. Also, it enables marketers to keep the online audience updated with all the current developments taking place in your industry domain. It gives way to daily promotions of your brand by posting marketing content on various social media platforms like Facebook, Instagram, and Twitter. Brand optimization with visual search is a great way to offer focused and defined results for your users. It allows the users to click a picture or upload a picture related to the product they are looking to find online. It directs them to the items without any hassle. Even though it is in its nascent stage, it holds great potential to become a leading digital marketing technology to deliver perfect results. Under this marketing trend, brands use key figures to promote their brand offering among the online audience. Instagram is rapidly growing up the ladder to become a major source of becoming a platform used for influencer marketing. As the network of social media is scaling up with every single day, there is a rapid increase in the number of influencers as well. Users tend to listen to these well-known celebrities and popular figures ardently. With the increased use of hashtags and promotional content directed by the influencers on their social media handles, smart brands are taking the content reference from these mentioned posts, and locating the precise on-brand engagements, thereby enhancing their performance of better user engagements. It also plays as a great medium to enhance human-to-human connections and showcase your brand creativity. An extension of AI to improve the efficiency of your marketing endeavors. Previously, ad industry was managed manually by publishers that controlled and ran the ad industry on the basis of hectic meetings with middlemen and unending negotiations. With the multiplication of online publishers on a daily basis, it has turned out to be a challenge for the advertisers to keep up the pace with it. The solution is bringing in automation in the advertising industry to take better control over things. It allows your brand to cut out the middleman and make the advertising procedure simply. Marketers are developing target-oriented ads that are produced by using and analyzing the personalized data of online visitors. It has enabled the brands to promote transparency in their advertisement campaigns and curtail the instances of fraud, created by the middlemen. It also makes the process of advertising quicker that leads to increased conversions, better ROI and a decrease in the cost of spending. 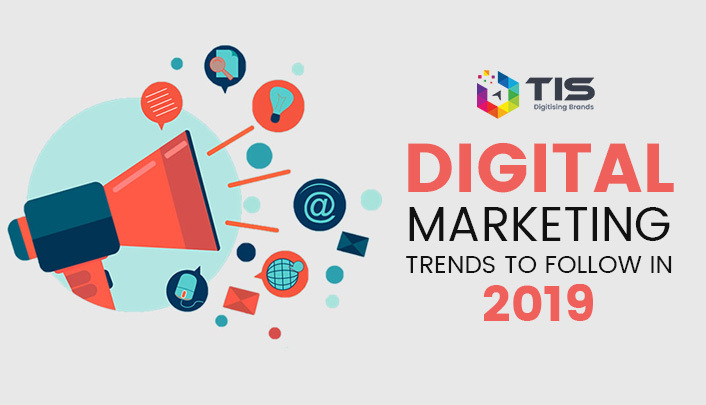 This digital marketing trend is definitely here to stay. It is one of the ever growing trends in the digital marketing world. Over the years, visible growth has been seen in user engagements led by pre-made video posts and live videos. It channelizes the information of a particular product or service to the audience in a much clearer manner, making a direct connection between the audience and your brand. Directly dealing with the audience via Facebook, Twitter and other social media channels with the help of personalized messages and video content enables you to improve the consistency of lead conversions, thereby leading to better opportunities of your business development. It is a mode where you engage with your customers on a real-time basis via an instant messenger and provides solutions to all their queries related to your brand offerings. Over the years, many companies have agreed to the viability of integrating chatbots in their digital marketing strategy to add value to their business. It also allows your brand to offer high-quality services to your customers at any hour of the day, and meet the expectations of your customers at every single time. It has been observed after research that almost 80% of the businesses are planning to incorporate the technology of chatbots in their marketing planning by 2020. Technologies of Google Voice and Apple’s Siri have already made a big name for themselves in the digital world. Voice search provides precise answers to the customers without confusions, leading to the desired outcome for them. Most of the successful marketers create a detailed voice script matching the customers’ requirements and offering creative solutions to their concerns. In the digital marketing world, people are looking forward to creating better voice scenarios based on surveys, internal data, and communications with real customers. Not just the target audience, it is also hitting successfully with the new and emerging digital audience as well, especially in the small cities and towns. To emerge as a successful marketer, you can very well explore the great potential of voice search for your marketing efforts related to brand promotions. It has been on the trajectory of growth in recent years in the digital marketing world. User-generated content is any type of brand-related content that is shared by the brand audience on their social media channels like Facebook, YouTube, and Twitter. Attention is better directed towards producing and promoting more and more user-generated content, as the targeted audience look forward to getting validations from social and digital marketing platforms. It also enhances customer engagements with your brand. It creates a chain of the customers that bring closer the potential leads with the existing customers smoothly. It is a growing trend among the millennial generation and needs to be used to its full potential to get better access to lead conversions and your brand promotions. 2019 will be all about enhancing the user experience by delivering better personalized, AI-driven and automated content. To stay ahead in the competition, you need to get a better grip on generating a custom content, integrating it well with audio and video enhancements to attract the attention of targeted audience towards your brand in a seamless manner.